Squirrels are common to all states in the US. Do you have squirrels chewing on your siding of your house? Squirrels nesting in the chimney? Have a nuisance squirrel eating all your bird food? Squirrels can be entertaining to watch, but often needto be removed because of the nuisance they can cause on and in your house. Live catch is simply being able to be close enough to grab the animal either by your hand (if young enough) or with a catch pole. Most squirrel babies are caught by hand once the mother squirrel is removed or isolated. Only a trained professional wildlife control handler should attempt hand removals. 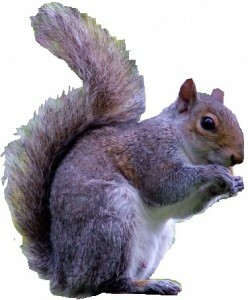 The dangers of handling squirrels are they have large incisor teeth and will bit, hard. 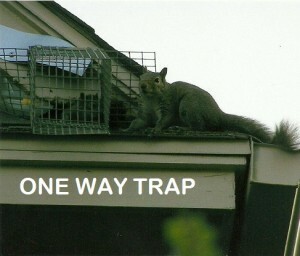 One Way Traps are common methods of squirrel removal and control. These traps are installed on an entry point to allow the squirrel to leave the structure but cannot re-enter. Trap and Removal of squirrels that continue be a nuisance to properties. Every situation differs from another, the wildlife control technician will decide with your approval which best fits your situation. Squirrels are part of the rodent family. There are 365 species of squirrels that are divided into seven families. The three most common are ground squirrels, tree and flying squirrels. The gray tree squirrel is the most common in the United states. The red squirrel is smaller than the gray squirrel and easily identified by its colors. There are two mating periods for squirrels. Late winter is the most common mating season. If food is abundant than late summer a second litter can occur. Squirrels have four to a litter on average. An interesting fact about squirrels are that the eyes are located high on their head. This allows squirrels to see a very wide view of vision.